Smash posters to their collection, and they’re completely amazing. 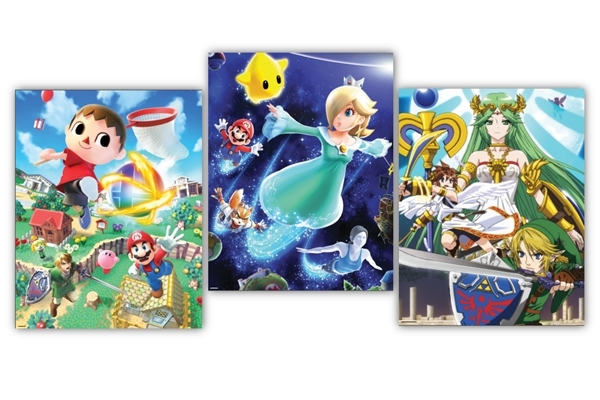 You can buy all three of them for only 700 coins on the North American Club Nintendo website. Super Smash Bros. Wii U and 3DS. Surround yourself with “smashing” style with this Super Smash Bros. 3-poster set. Each gorgeous, full-color poster stars a Smash fighter in top form against three challengers. Feast your eyes on Villager from Animal Crossing™, Rosalina & Luma from Super Mario Galaxy™, and Palutena from Kid Icarus™: Uprising. Features art inspired by the Super Smash Bros. for Nintendo 3DS/Wii U game. This item will ship within two to three weeks of placing your order. You can place an order on the posters here. What do you think? Are you going to get these? Which one’s the coolest?